At this time last year I was pretty much vegetarian. I never bought meat or cooked with it, though I would eat it if it was served to me, and I sometimes ordered it when I ate out. I had several reasons for eating vegetarian, such as the lower fat/sodium diet, being conscious of how animals are treated and meat is processed, and because it’s cheaper on a tight food budget to not buy meat. All those reasons are still true, but in the past couple months i have found myself craving meat all the time. So, I caved, bought chicken for the first time, and since then I’ve been diving into the chicken recipes of my childhood. I pretty much grew up on chicken (one of the few meats that everyone in my family liked), and this chicken enchilada recipe was one of my all-time favorites. This recipe comes from my mom, who originally got it from her friend Annie, and she graciously passed it on to me (written from memory!). Boil the chicken breasts in a pot of water until cooked, usually about 20 minutes. If you are using frozen chicken, you can add the frozen chicken to a pot of cold water and slowly heat to a boil. Let chicken cool and chop up. Chop onions, set aside half for assembling enchiladas. Saute remaining onions in oil or butter for 1-2 minutes. Add chopped green chiles and fry for 1-2 minutes. Add flour and let it cook with the onions and chiles. It will form a paste. Next, add the sour cream and cook until thoroughly heated, stirring continuously. Add chicken broth. If you prefer a saucier liquid, you can add more water at this stage. Continue to stir sauce over medium heat. The sauce will thicken. When the sauce is as thick as you want it, turn off heat and add 1 cup shredded cheese. Stir until cheese has melted. Set aside. Now it’s time to assemble the enchiladas! 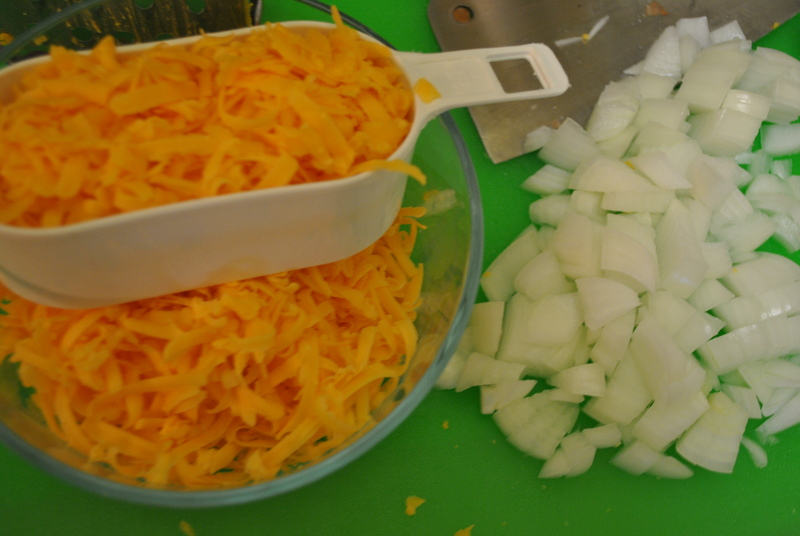 For my enchiladas, I use chopped chicken, chopped onion, shredded cheese, and salsa. 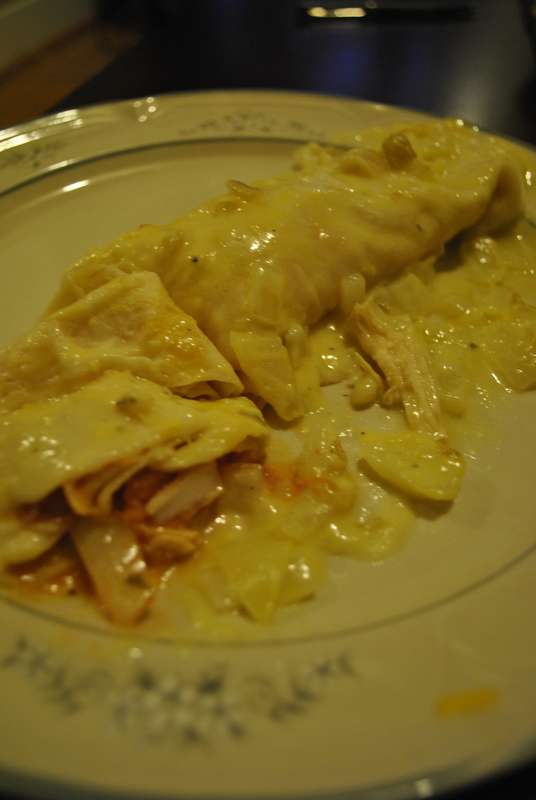 My family includes some picky eaters who preferred only chicken and cheese in their enchiladas. Feel free to create your own version with a different filling – this recipe is adaptable! Using your flour tortillas, simply put the desired amount of filling in the tortilla, and roll. Spray the cooking pan with non-stick cooking spray. As each tortilla is filled, add it to the pan. Once the pan is full, pour the enchilada sauce over the tortillas. This should fill the pan. Bake for about 25 minutes. Check for crispiness around the edges, which will occur if the tortillas are not covered with sauce. You can cover the pan with foil if the enchiladas begin to get crispy. Remove from oven, serve immediately. 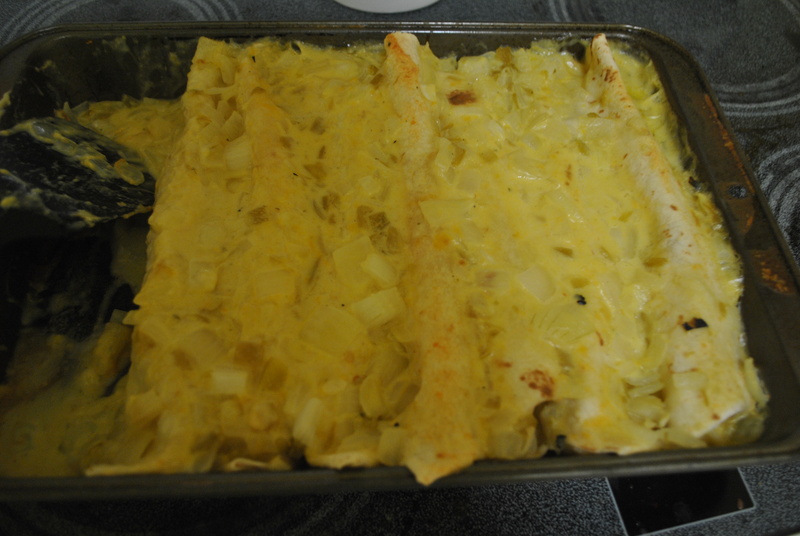 These enchiladas keep well and taste great as leftovers.